What are the symptoms and risk factors for diabetes? Posted in General Health on February 11, 2013. Last modified on January 31, 2018. Read disclaimer. When we eat, our body turns most of the food into sugar (glucose) which then gets converted into energy with the help of the hormone, insulin. In people with diabetes, either the pancreas does not produce ANY insulin (known as type 1, insulin-dependent, or juvenile diabetes -- since it usually shows up in childhood); or the pancreas produces too little insulin plus the cells in the muscles, fat and liver are unable to utilize that insulin properly (known as type 2, adult or non-insulin dependent diabetes). 90-95% of people diagnosed with diabetes are type 2. This results in above normal blood sugar levels at the same time that the cells are being starved of energy. Of the estimated that 1/3 of all Americans1 (or 100 million of us) who have type 2 diabetes or are prediabetic, 1/3 are not even aware of it. Unfortunately, 90% of type 2 diabetes could have been prevented by controlling lifestyle factors. So, why is diagnosis and treatment important? Because diabetics who fail to properly manage the disease (blood sugar levels above 100 mg/dL) live an average of 6 years less than nondiabetics2! 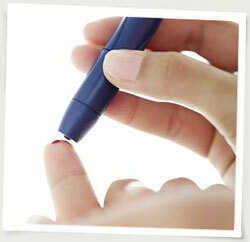 In addition, a simple blood test is suggested for anyone who has one or more of the following diabetes-risk factors. age 45 or over. In fact, most newly diagnosed diabetics are the 45-55 age group. Unfortunately, there is no cure for diabetes at this time. And left untreated, diabetes can lead to heart and kidney disease, stroke, blindness, nerve damage, gum infection, amputation and more. In fact, diabetes is the 7th leading cause of death in the United States. The good news, on the other hand, is that a person with diabetes who is diagnosed early and takes care of him or herself has a good chance of living a full, healthy life. Also known as insulin resistance, prediabetes is condition where your cells have begun to ignore insulin, leaving blood sugar to sit in the bloodstream. Responding to this perceived "need" by the cells, our pancreas produces even more insulin until, eventually, the pancreas becomes weakened and blood sugar levels soars. Fortunately, lifestyle changes can often prevent prediabetes from progressing into full-blown diabetes. eating a healthy diet that is high in fruits, vegetables, fish, chicken, turkey or other lean meats, beans, high-fiber whole-grains and low-fat dairy products. Limit your intake of fatty foods, salt, refined carbohydrates and, according to at least one study, sodas. exercising 30-60 minutes most days -- even if this is just a brisk walk. taking prescribed medication -- even when you are feeling good. Melbourne, Australia - Low Vitamin D levels are associated with type 2 diabetes risk, that's according to a study published in Diabetes Care. Scientists from the University of Melbourne in Australia found that people with lower than average Vitamin D levels had a 57% higher chance of developing diabetes than people with Vitamin D levels. Researchers measured Vitamin D levels in over 5,000 people without diabetes. After five years, researchers measured Vitamin D levels again and determined that 200 of the participants had developed diabetes. They found that 6 in 100 people with low Vitamin D levels developed diabetes, versus 3 in 100 with regular levels that developed diabetes. When they factored in diabetes risk factors, the risk of diabetes increased to 57%.